During the 1980s, George Mason University was still a relatively little known local institution that had been quietly growing year by year. Despite an impressive building program on campus and a rapidly growing student body, the University still lacked a major accomplishment that would allow it to compete with the leading institutions of the era. That would all change in 1986 when a faculty member in its Economics department, Dr. James M. Buchanan, won the Nobel Prize in Economic Sciences. Buchanan began developing his Public Choice Economics Theory in the late 1950s when he accepted a professorship at the University of Virginia. Also on the school’s faculty was G. Warren Nutter, a former fellow doctoral student of Buchanan’s in Chicago. The two decided to continue their previous doctoral work on a “public choice” system of economics, dealing with public officials’ economic interest in public safety and other government interactions. Quite simply, Buchanan maintained that it was naïve to think that elected officials are public servants who principally make policy in the “public interest.” Rather, he argued, they make decisions based upon their own self-interests and motivations. In 1957, the University of Virginia established the Thomas Jefferson Center for Studies in Political Economy, designed to introduce economics students to public choice theory.The new center would be visited by high-ranking scholars, such asFrank Knight, and also hire new instructors, such as Gordon Tullock, a post-doctoral fellow. During the 1959-1960 academic year, Buchanan and Tullock collaborated on The Calculus of Consent, which would go on to become the most respected work on the topic of Public Choice economics. Towards the end of the 1960s, the University hired a new director of the Center who changed its approach to the teaching of economics. Buchanan did not agree with this move, and in 1968 he left Virginia to take a one year teaching position at the University of California Los Angeles. After his one year term at UCLA ended, Dr. Buchanan moved back to Virginia in 1969 to join the faculty of Virginia Polytechnic Institute, better known today as Virginia Tech. Dr. Gordon Tullock and the faculty at Buchanan’s Thomas Jefferson Center at Virginiathen moved to Virginia Tech to rejoin Buchanan. The new center was named the Center for the Study of Public Choice.The Center was housed in the University president’s former residence. Buchanan would later remark that the new office configuration permitted faculty members to simply open their doors and consult one another. He also liked the building because it was freestanding, and spacious enough that all classes affiliated with the center could be taught inside of it. Buchanan and his colleagues were content to stay at Tech for the next fifteen years, until another university offered a new home for the Public Choice Center. George Mason University had only been an independent university for eleven years in 1983 and had a promising but relatively unknown Economics Department. University President George W. Johnson was in the midst of implementing his ambitious faculty recruitment plan, a then-radical approach which promised new faculty more control over their courses. Mason professor, Dr. Karen Vaughn, then Chair of the Economics Department, along with J. Wade Gilley, Vice President for Academic Affairs, convinced Buchanan to move the entire Public Choice Center to Mason. 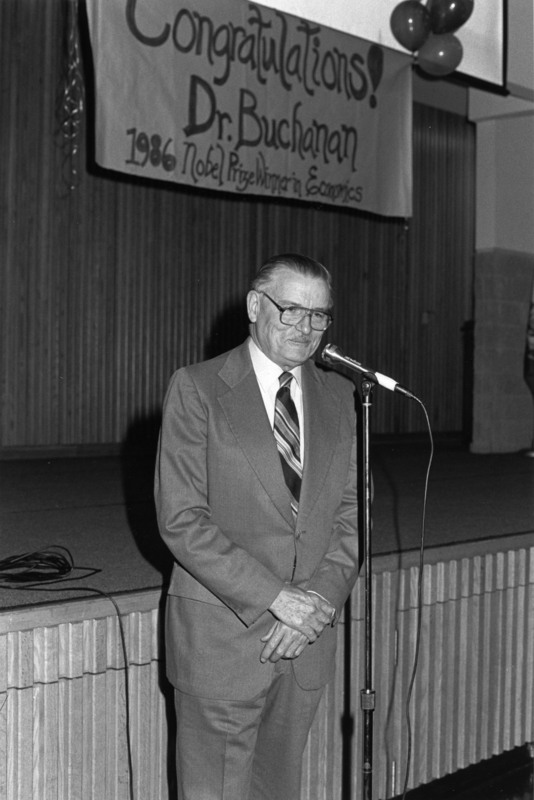 The arrival of Buchanan and his associates in 1983 doubled the size of Mason’s Economics Department, which had just begun to offera doctoral degree program. Gordon Tullock once again followed the Center to Fairfax, its latest home. Dr. Tullock remained at Mason for a few years before leaving to teach at the University of Arizona. In 1999, Tullock returned to George Mason to teach courses at the School of Law.He retired in 2008. Economist Dwight R. Lee joined the Center in 1981 while it was still at Virginia Tech. He followed it to George Mason, where he remained until 1985. Lee is now a faculty member at the University of Georgia. On October 16, 1986, Dr. Buchanan was notified that he would be the recipient of the 1986 Sveriges Riksbank Prize in Economic Sciences in Memory of Alfred Nobel for "his (Buchanan’s) development of the contractual and constitutional bases for the theory of economic and political decision-making.” This prestigious award had previously been given to such luminaries in the field of economics as Milton Friedman and Friedrich Hayek. University President Johnson commented that the award rightly “calls attention to GMU” and added that “we are basking in his (Dr. Buchanan’s) reflective glory.” Dr. Buchanan was presented with the award on December 8, 1986 in Stockholm, Sweden. The first-ever Nobel laureate in the Virginia State University System, Dr. Buchanan was asked by Dr. Johnson to be George Mason University’s 1987 Commencement Speaker. Since being awarded the Nobel Prize, Dr. Buchanan has continued to play an active role in the field of economics. He is currently a professor emeritus at both George Mason University and Virginia Tech. In addition to contributing to the field of economics, Dr. Buchanan’s Nobel Prize helped firmly establish Mason’s emerging reputation as one of the finest public universities in the Commonwealth of Virginia. Browse items related to James M. Buchanan.